The New York Times's Tobin Harshaw summed up the speaker's take-home lesson from the Juan Williams dust-up nicely: "Let me suggest a broadcast journalism rule of thumb: if you start a statement with the words “I’m not a bigot, but …” just stop talking. Trust me — it’s not going to end well." Every day, speakers give themselves away with their own words, denials and verbal exceptions, belying the very things they say. It doesn't have to be a big incident, either. Juan Williams's "I'm not a bigot," used in explaining his remarks about his discomfort at seeing people in Muslim dress on airplanes, or Richard Nixon's "I am not a crook" in response to allegations of wrongdoing in the Watergate scandal, are just the high-visibility examples people are talking about. But there are more common, less famous denials that undermine speakers' credibility. Think of these as any sentence that starts with a declarative statement, in which your audience can tell there's a "but" clause coming shortly after it starts. Have you been guilty of these credibility drainers? "I know you all have a lot of questions, but I have a great deal of materials to cover..." announces that you think your material is more important than your audience. While that may be true, it's not a great way to build your reputation with your listeners. "They told me to say this..." isn't just unfair to your staff, boss or trainer. It saps your credibility by suggesting even you don't believe in what you're about to say. Why then, should we? At best, it suggests you're going to mess up your prepared remarks or didn't practice enough, and want to blame it on someone else. "I know I only have five minutes, but..." tells us that you are about to violate not only the time allotted to you, but are overconfident of your ability to hold our attention. 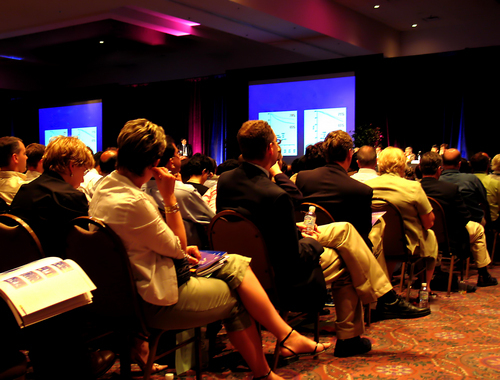 If you're on a panel, you've just alienated your fellow presenters, along with the audience. "I have too many things to say, so I'll talk faster." I once watched a candidate for high office in a membership organization announce this before a strictly enforced 5-minute statement in front of those who'd be voting for her--then listened to her speed-talk about 20 minutes of points (with slides) into the limited time. She got ridicule, not votes, and lost. Trying to fix one problem by adding another suggests poor judgment on your part. What else have you heard speakers say that saps their credibility? Share your gems in the comments. Subscribe to Step Up Your Speaking, the free monthly email newsletter from The Eloquent Woman -- right here....then become a fan of The Eloquent Woman on Facebook and join the conversation with thousands of other women (and men) about public speaking skills and confidence.